London, UK. - The ATP, governing body of the men’s professional tennis circuit, today unveiled the latest evolution of its advertising campaign - FEEL IT. Now in its second year, the multimillion dollar campaign, will again feature ATP World Tour stars including Rafael Nadal, Roger Federer, Novak Djokovic, Andy Roddick, Andy Murray and James Blake, showcasing the sport’s core values as a one-on-one gladiatorial battle of world class athletes, full of intensity and passion. Created as a flexible and adaptable central resource that can be utilised in any of the ATP’s 63 tournament markets, the campaign has been specifically designed to include any player featured on the ATP World Tour and is part of a global marketing initiative in 2009. 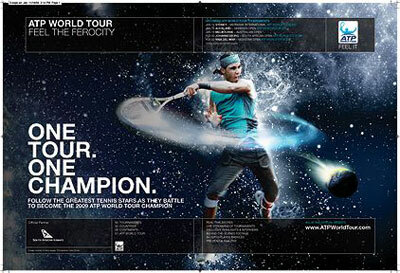 The 2009 version of FEEL IT will focus on bringing to life the unique global aspect of the ATP World Tour. The evolution of the campaign will position ATP World Tour stars like Rafael Nadal as titans of the sport; playing tennis that is ‘out of this world’. The new execution will bring to life many of the amazing locations of the ATP World Tour and will focus on communicating the ultimate goal of the season, to become the 2009 ATP World Tour Champion. The FEEL IT campaign, featuring a full suite of above and below the line executions including TV spots, billboards, online banners, virals, merchandise, fan giveaways and PR stunts, has proved to be a huge success in 2008 with ATP World Tour tournaments around the world using the campaign for advertising and promotional purposes. FEEL IT is one part of a global marketing overhaul for the ATP which also includes a full rebrand of the Tour, a new online approach and a global promotional campaign designed to better promote the sport globally and broaden the appeal of men’s professional tennis by making it easier for fans to follow. The changes have been made following two years of extensive and independent, global research of over 20,000 fans at all levels of tennis interest. The new category names reflect the number of South African Airways 2009 ATP Rankings points available to the tournament winner and at a stroke help fans better understand how tournaments relate to each other and to the ranking table. At the end of the season the world’s top 8 ranked men’s singles players and 8 doubles teams, based on their performance throughout the year, will qualify to compete in the season’s climax - the Barclays ATP World Tour Finals. To be held at London’s O2 arena, the event will officially crown the 2009 ATP World Tour Champion and determine the final 2009 player standings. To support and communicate these exciting changes to players, sponsors, media and fans, the ATP has developed a new, strong and distinctive ATP World Tour approach that will bring all 63 tournaments in 31 countries under one, exciting and accessible overarching brand. The logo, along with the respective tournament category will, for the first time, be included on the net at every ATP World Tour event from early 2009 as an easy way for fans at home to understand the new brand.